Caviar Noir was started in 2012 by designer Julie Ramos. I love that this line mixes materials so there's the perfect juxtaposition between hard and soft. I'm not a pearls girl, but I like the edge the handcuffs give this pearl necklace, appropriately named the "Lady Rebel Necklace." Many of Caviar Noir's pieces are designed this way which means they work perfectly with a feminine maxi dress or a pair of jeans and combat boots. No matter what your style, there is at least one piece of Caviar Noir that you're sure to love. I can't wait to see this line in person at Posh in Hillsboro Village from March 13-19. Join me this Friday from 4-7pm for a Caviar Noir Trunk Show. We'll sip champagne, snack on cupcakes and try on a whole lot of jewelry. I was thrilled that Julie had some time to answer some questions for me about the line.. When did you start designing jewelry? It all started when I was looking for body chain jewelry all over the internet and in stores, but they were nowhere to be found. This was before this trend started becoming mainstream. So I decided to make my own. I wore it out to parties and I would receive lots of compliments. It was jewelry no one had ever seen before, but it took well to the mass. How did Caviar Noir begin? It all started when I started posting my work on my Facebook page. People would comment and I would receive positive feedback. It was then that I thought to myself, "hey... I could start a jewelry line!" There was nothing else out there like it (at the time). What does the name mean? I would describe caviar as being luxurious and sophisticated. I would describe noir as being dark and edgy. I put them both together and that describes my designs. Who or what inspires your designs? Femininity mixed in with some masculinity is the style I convey in my designs. I am inspired by strong women who know who they are and what they want. They exude confidence and have a strong sense of style with an edge. Some women that possess that quality are Gwen Stefani and Rihanna. With your punk aesthetic, does music influence your design? If so, what bands are you listening to? Yes, music does have a big influence on my design. I currently have No Doubt's Push and Shove album on my playlist. I love how the songs are dramatic rock with a hint of reggae beats. Its an unexpected musical twist. I think it translates into my designs because I try to incorporate pearls and other gemstones in an edgy way. What are your favorite materials to work with? Pearls and chains!!! Pearls remind me of caviar and chains add that noir edgy side. What are some of your favorite pieces from your current collection? 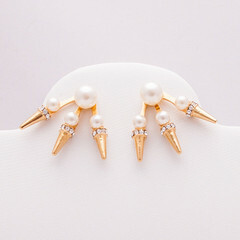 The Valeria Earrings are one of my favorite and are one of my newest designs. They are 3-dimensional earrings that are unlike anything out in the market today. What current trends do you love? Are there any you wish would be retired? Although I get nostalgic with the 90's flower-printed everything, it was something I wore back when I was a kid and would never wear it now. So I guess I would have to say the flower print trend should be retired. If Caviar Noir was a cocktail, what would it be? It would be a Black Velvet. Its a beer cocktail made from Guinness and champagne. Its classy and simple. Thanks Julie! View more Caviar Noir here. Find your favorite pieces and then come see me on Friday at Posh in Hillsboro Village.